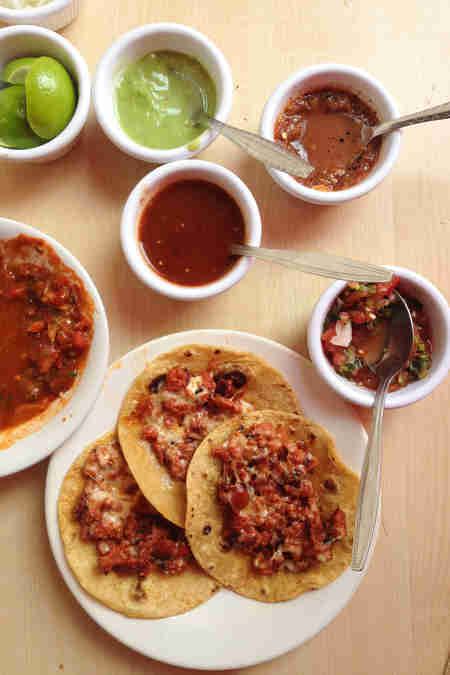 In Mexico City, you can easily trip and fall into the best taco of your life. 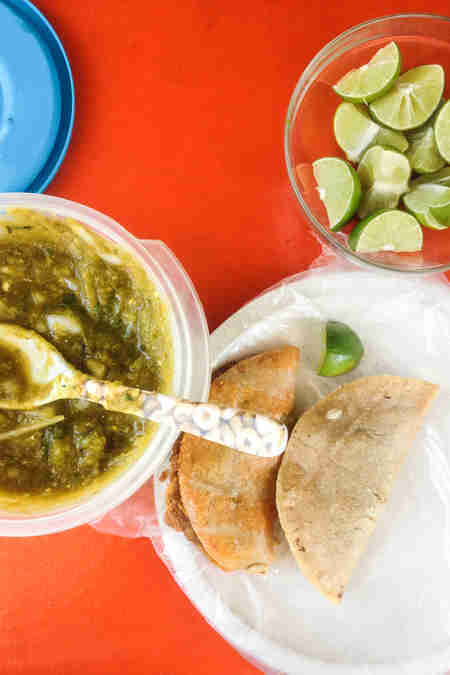 Eating is a pivotal part of the culture, whether it's pork-stuffed fried gorditas scarfed shoulder to shoulder at a crowded street corner or queso fundido during a four-hour-long lunch. 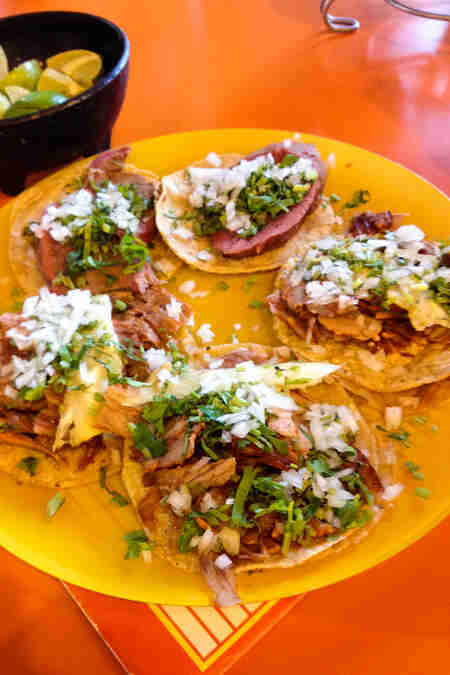 But amongst all the amazing food the city has to offer, the taco reigns supreme in the hearts and minds of both foreigners and natives alike. 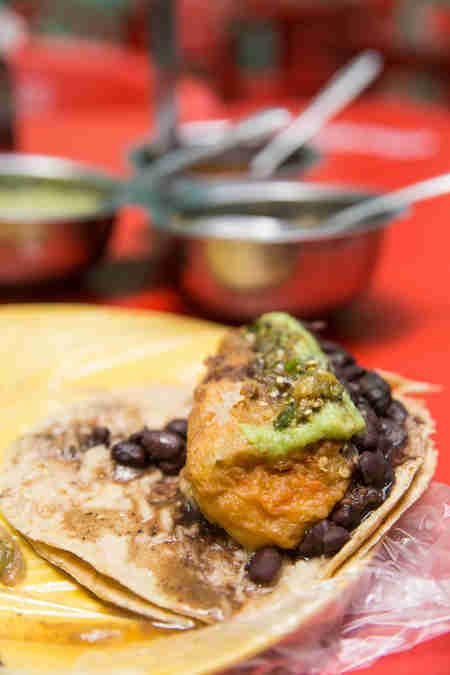 In a quest to document the best the city has to offer, I photographed every delicious taco I ate over the course of my month-long exploration of Mexico City. 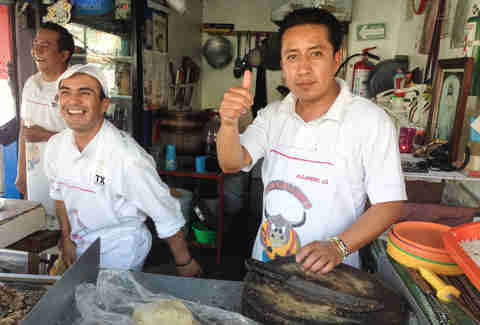 ​Pastor is king in Mexico City, and thus this list leans heavily towards the spitted pork. It's rare to see an authentic version in the States, but in Mexico City (or, as locals call it, D.F., which is short for distrito federal) most taquerias have a simmering cone of the red chile-marinated pork outside their doorstep to attract passersby. The cherry on top is a hunk of fresh pineapple. 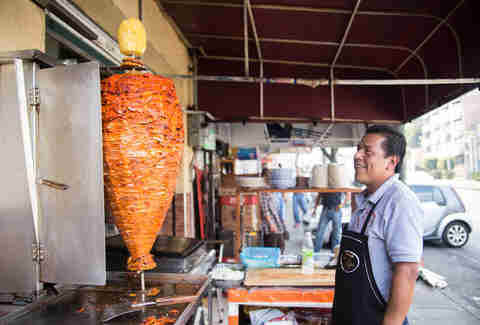 Basically it's the Mexican version of doner kebab: the meat slowly rotates next to a flame, cooking the outer layer but keeping the interior at food-safe temperatures. The guy tasked with manning the spit will slice off hunks of pork directly into a tortilla, then take a skillful swipe at the pineapple to add a citrusy kick. It's not unusual to see the pastor dudes catch the pineapple behind their back. It's also not uncommon to see them fail miserably at this trick. Admittedly, this is far from a completist taco-pedia, and most of these are in fairly close proximity to the Roma neighborhood where I stayed. But caveats aside, I did my damndest to eat as wide a variety as I could, everywhere from nebulously sanitized street stands to fine-dining spots that rank within the world's top 50 restaurants. Read on to see all the tortilla-wrapped glory. 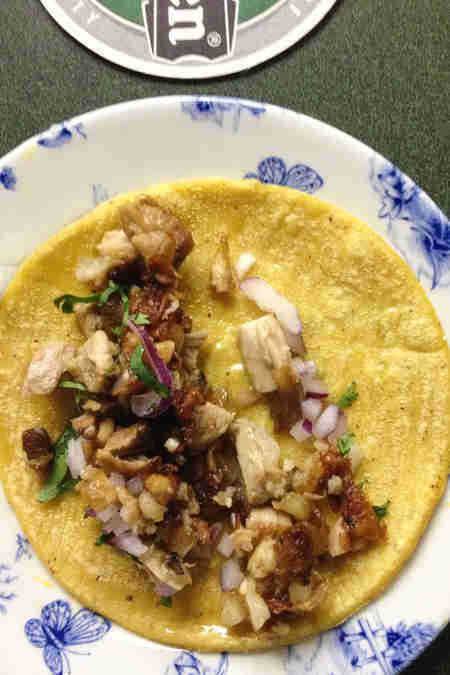 Whether or not the veracity of their claim of inventing the al pastor rings true, El Tizoncito still slices some of the most savory pork in the city. One way this student body gets fed is at a bus stop taco stand serving hearty pre-made tacos de canasta. 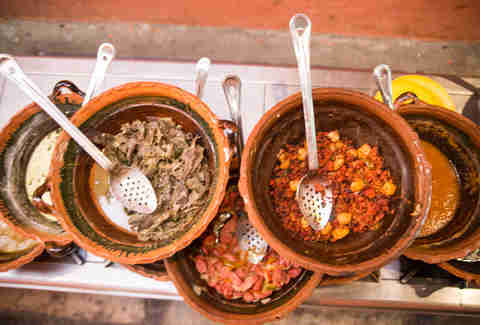 Canasta means basket (where the tacos are kept warm), guisado means stewed, and four pesos means you're not hungry anymore. Tucked behind a load of construction in the affluent neighborhood of Polanco, Farolito's a real-deal taqueria whose chorizo con queso is the perfect match of melty cheese over crispy, slightly charred meat. Contramar's reputation as a must-visit lunch spot is well deserved. This tuna taco applies their upscale take on seafood to Mexico City's most iconic dish. 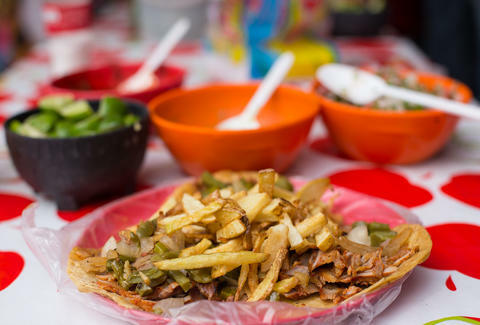 Papas fried to order (plus cactus and grilled onions) make these tacos worth a stop on the way to Palacio de Bellas Artes. 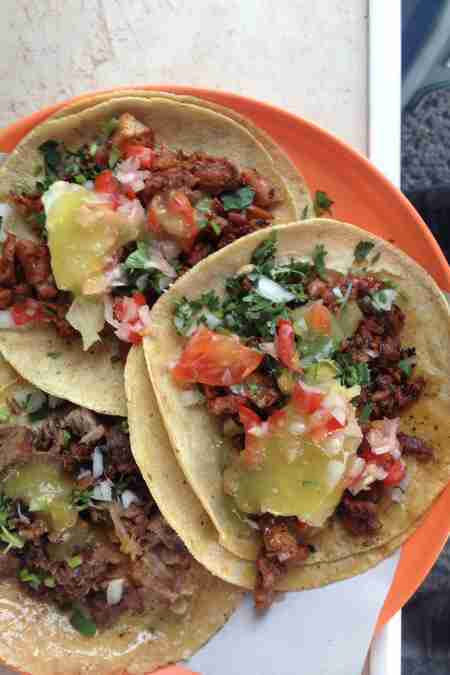 A few blocks East of the Tacubaya metro stop, Don Pepe has been dishing out tacos since 1945. The fatty cow's head (cabeza) is a rich, earthy treat. 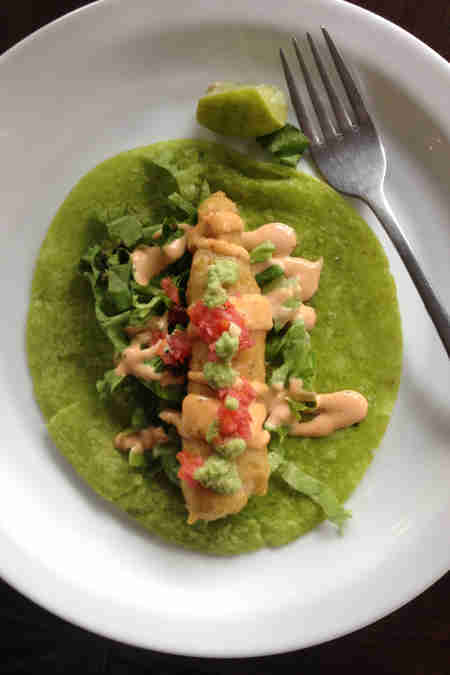 Fish tacos are a relatively new phenomenon in Mexico City. Calmantes Montes fries crisp battered chunks of pescado that are essentially the best fish sticks ever created. Pujol consistently lands on the short list of best restaurants in Central and South America, and their taco didn't disappoint. 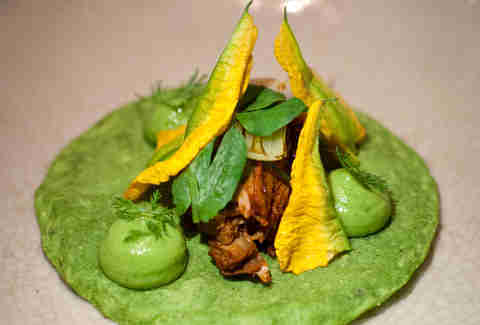 Hiding underneath the avocado leaves (and behind the avocado puree) is a thick hunk of suckling lamb. 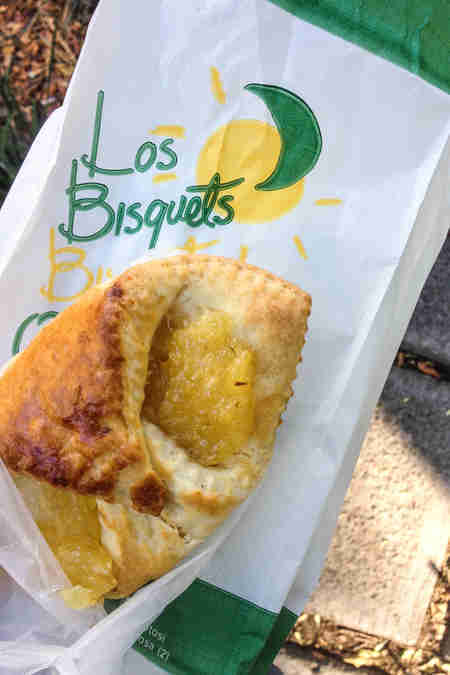 A slice of pineapple is a staple in any authentic al pastor taco, here that piña sneaks into a hearty folded pastry that's been blessed with the taco moniker. 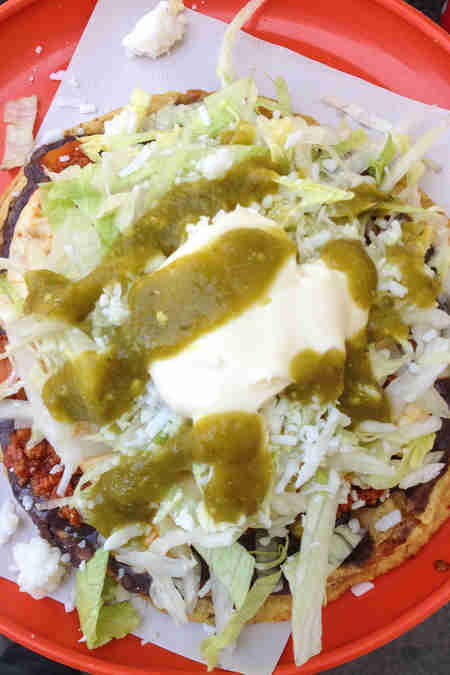 Although a sope's not technically a taco, this monstrous mound of mashed black beans, fiery red picadillo, lettuce, and crema had to be folded like a taco to eat, so it counts. And it cost only 20 pesos (~$1.32). 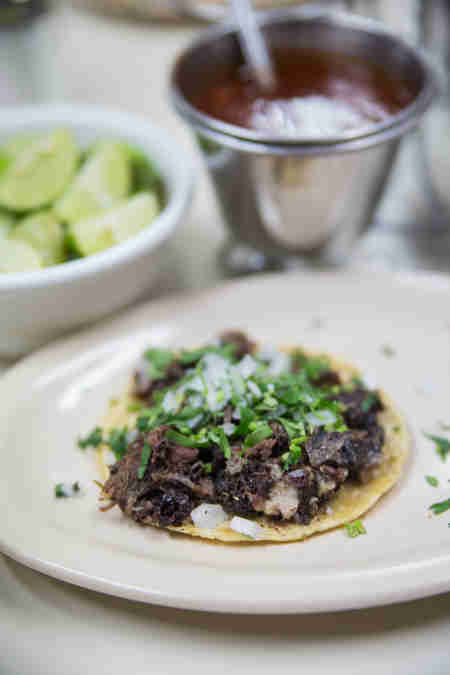 After I told a local food writer that I hadn't yet eaten any barbacoa, I received a text the next day letting me know that he had a source. His girlfriend's family's barbacoa connect from Hidalgo was making a special delivery and I had the opportunity to get in on a half-kilo. At the end of that not-at-all shady deal, I was delivered a homemade pound of the remarkably succulent lamb, eaten in the comfort of my Airbnb. 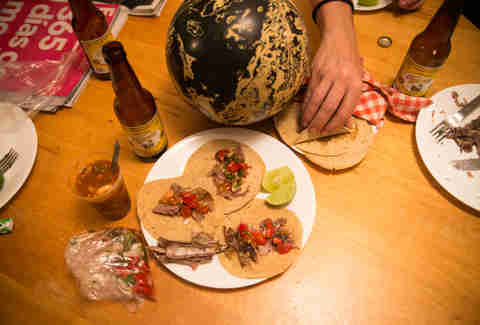 You don't see marlin on many American menus, but down the side street of Jalapa across from the best damn vinyl record store in the city (Retroactivo) you'll find a tiny taco shop that makes a serious case for considering the fish stateside. 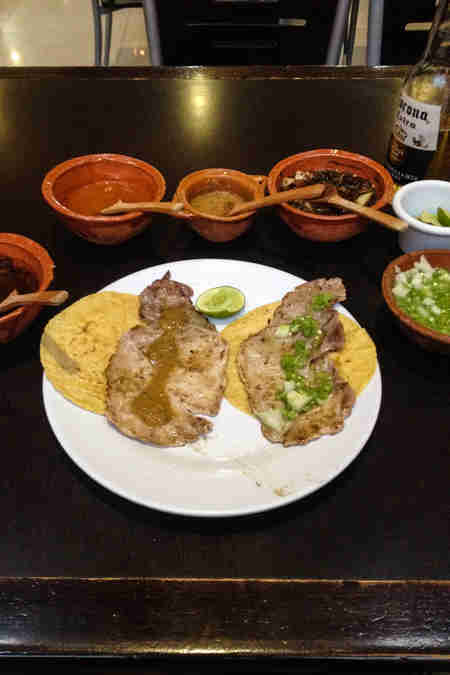 A late-night staple perfect for both before and after partying at the nearby Imperial dance club, Faraón does a mean pastor, but also skinny pounded pork steaks called chuletas. 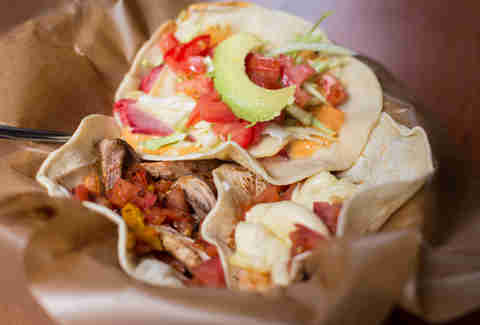 These were the street tacos that broke the camel's back. 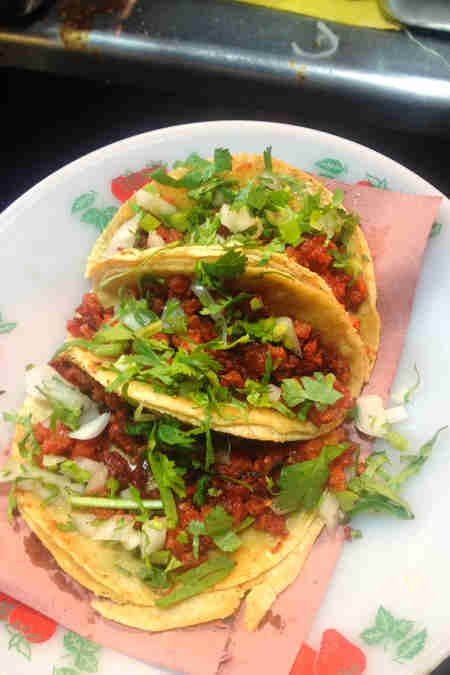 I spent the first week of my trip eating with reckless abandon at stands with nebulous sanitary practices, and although delicious, these chorizo tacos left me with a two-day stomachache. An old cantina that's been given a hip makeover, the move at Riviera del Sur is to bring a crowd and order everything, especially the crispy chopped pork lechón. Around 6pm, Puebla St just South of Chapultepec comes alive with several blocks' worth of food vendors. 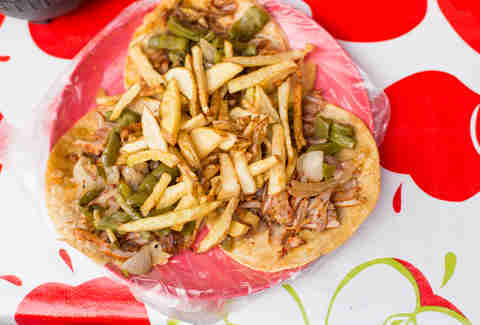 Antojitos is run by a family from Merida who dish out stewed pork topped with pickled onions and dangerously hot salsa for less than a dollar each. If you go to El Parnita for lunch on a Friday, you won't leave until well after dinnertime. 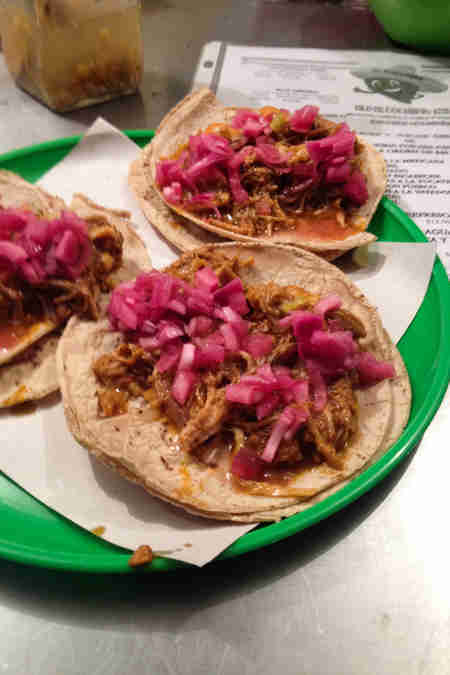 It's one of the coolest little taquerias in town and known for a lingering hipster clientele. 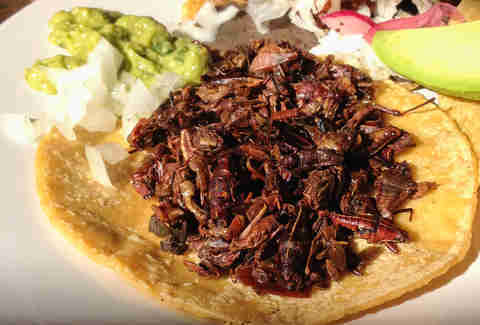 The off-menu chapulínes are a crunchy delicacy, and will make you happy to be picking grasshopper legs out of your teeth. 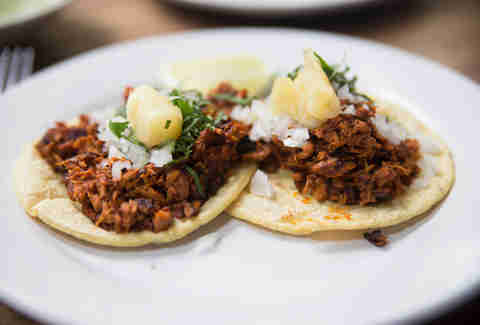 Álvaro Obregón was the president of Mexico from 1920 to 1924, and his legacy is remembered through the name of one of the Roma neighborhood's busiest boulevards, and also, a pair of totally reasonably priced taquerias dishing out 10-peso pastor and thick, juicy lengua. 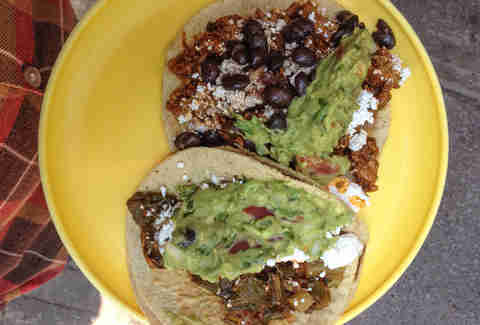 La Condesa's premiere hole-in-the-wall taqueria dishes out huge portions of stewed meats and vegetables (known as "guisado") and mounds them with guac, black beans, and a host of other toppings. It's one of the few instances where two tacos make a meal, and an even rarer instance of actually seeing vegetable fillings like chard (acelgas). Another Condesa guisado slinger, La Glorieta's relleno is a crispy battered log of cheese-filled pepper spicy enough to warrant a concerned warning from the guy serving it. Thumbs up to you too, Mexico City! Dan Gentile is a staff writer on Thrillist's National Food and Drink team. 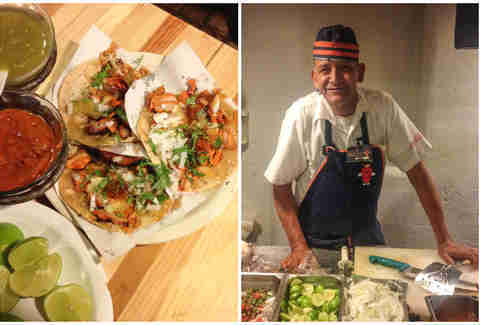 He highly recommends a visit to Mexico City and personally endorses all of these tacos. Follow him to tortilla-wrapped tweets at @Dannosphere.